Playing Around at Board Game Station Coffee. 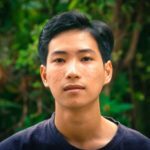 Editors Note: I’m very pleased to introduce the first article from guest author Binh Vu. I asked Binh to find me some interesting places around town that are unusual but still of interest to visitors. 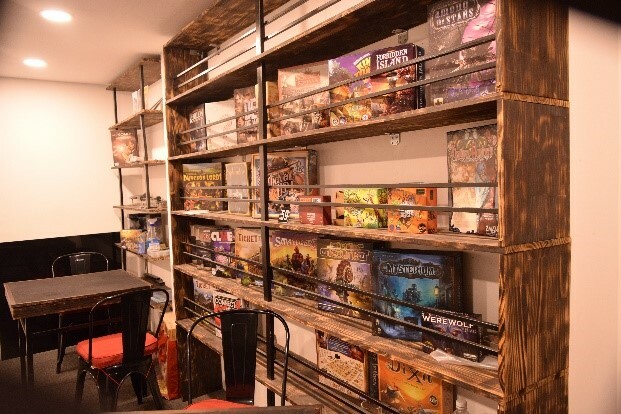 His experience at Board Game Station Coffee certainly has me curious. With the crazy weather at the moment, this unique little café seems like a perfect escape for a few hours. Take it away Binh…. 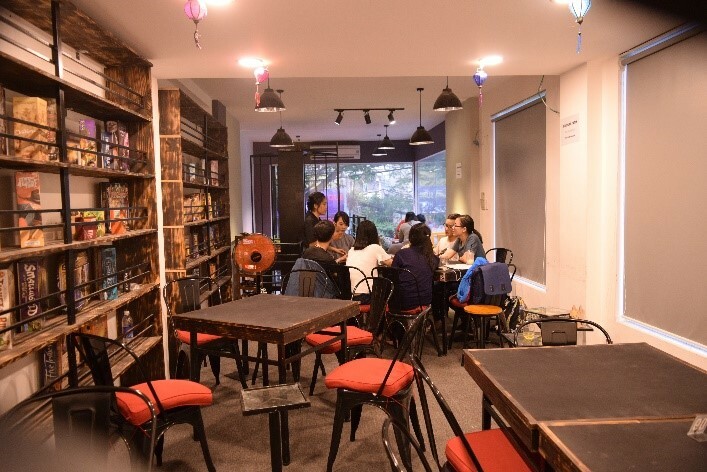 It was about 2 p.m and scorching hot when my friends and I arrived at Board Game Station Coffee. Given its central location, right by the Backpacker area in District 1, I was a little surprised that the street was not bustling. As soon as we stopped at the door, a young man in black uniform appeared and showed us where to park our scooters. We opened the door and found ourselves in a long, narrow, well-lit room. What struck me first was the overall design and furniture were rather ordinary, yet very conducive to playing board games: small square wooden tables and wooden chairs with soft pillows. A young lady in black uniform greeted us warmly and led us to a small counter a few steps from the entrance. As newbies, we were curious to find out how things worked. She told us we would need to buy a ticket each for 70.000 VND. That allowed us to play board games for an unlimited time, with one drink included. Before we could even consider whether that was a good deal or not, the receptionist suggested an even better value option. 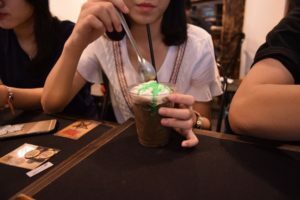 We could join their membership program for only 56.000 VND each, which gave access to unlimited games and one drink from the menu. Bargain – a 20% discount! All we needed to do was to provide our names and phone numbers and were members in the blink of an eye. After choosing our drinks, we went upstairs where another group of young people were playing. We’d been warned they could be a little noisy, and could play on the ground floor instead if we preferred. (If you come during prime time, there might be many groups of people playing, and noise is inevitable.) We decided on sitting upstairs and chose a place where we could join two smaller tables to fit our group of seven. The young lady then brought us two board game catalogues; one labelled “casual”, the other “advanced”. She explained that casual board games usually took about 10 to 30 minutes to play, while advanced ones might take 45 minutes to several hours. We were completely shocked when she told us that “Game of Thrones” usually took 6 hours to finish. What I liked most was that she made her instructions short, simple, and clear. All of us agreed, the afternoon at Board Game Station was a very enjoyable experience. The design was lovely, and the staff were welcoming and skilled at making the games easy to play. The greatest thing about this coffee bar, however, was the board games. I am quite impressed by the owner’s excellent taste in board games. 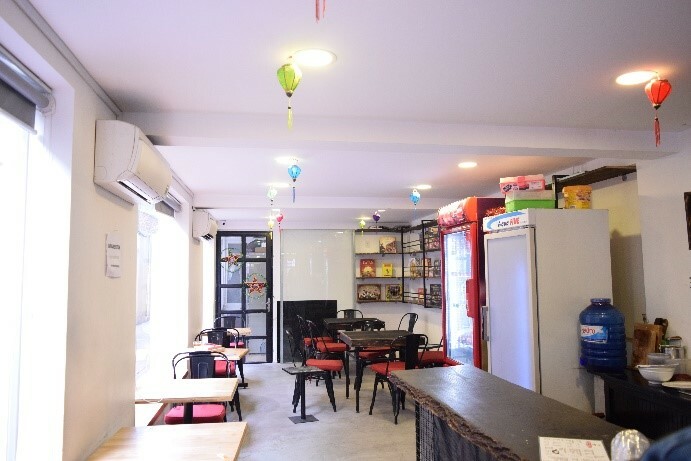 The prices were affordable for members, compared to other coffee bars in the same area. It’s quite hard to find another place like this in downtown Saigon. They have an interesting drinks menu and a few special drinks such as “first kiss” you may want to try. 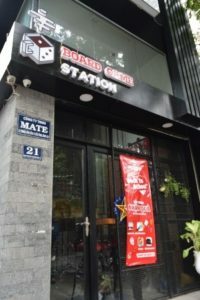 If you’re looking for something unique and different while visiting Saigon, or just want to get out of the hustle and bustle for a while, then a visit to Board Game Station is a fun activity with friends. If you’re going to be around for a while, you can save quite a bit by joining their membership programme on your first visit. Editor’s Note: Do you have a suggestion on where else Binh should visit and write about? Tell us in the comments below. I’m a native Saigonese. At the moment, I’m a senior undergraduate and working part-time as a teaching assistant at an English language school. I’m also an amateur photographer. I believe there are a lot of interesting places in this city that are well-known to the locals but which are still unpopular among foreign visitors. What I always want to do is to unveil the hidden beauty of my hometown to my foreign friends by introducing them to these places. Previous story NEW!!! Awesome GPS-guided travel articles for Ho Chi Minh City.